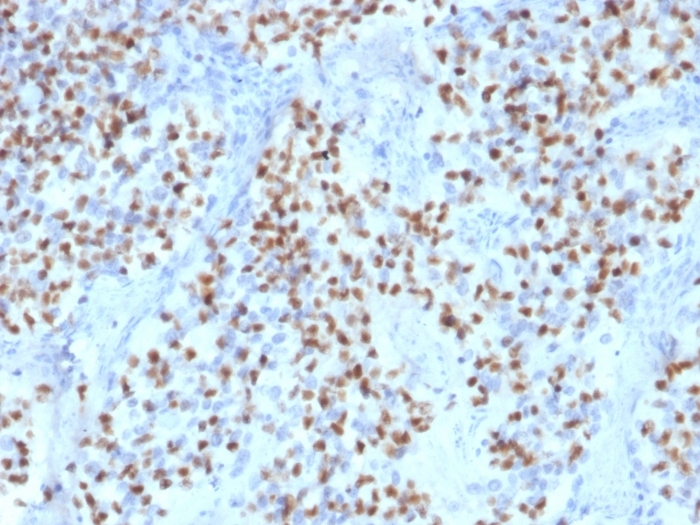 Formalin-fixed, paraffin-embedded human Tonsil stained with Oct-2 Mouse Monoclonal Antibody (OCT2/2136). 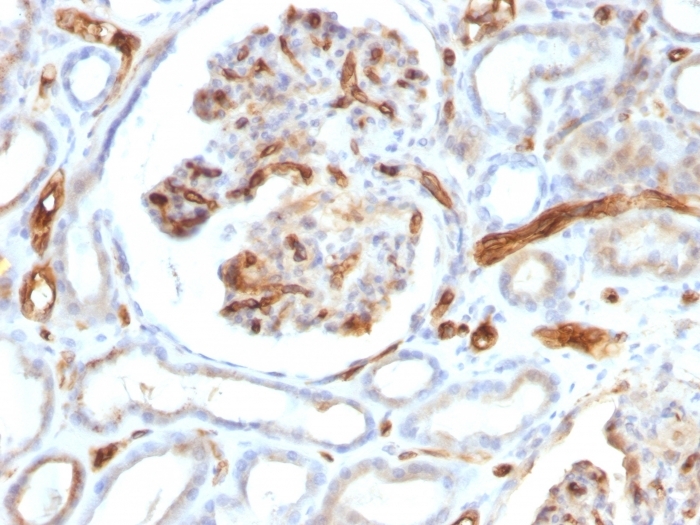 Formalin-fixed, paraffin-embedded human Lymph Node stained with Oct-2 Mouse Monoclonal Antibody (OCT2/2136). 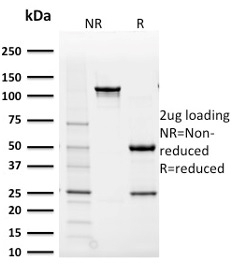 SDS-PAGE Analysis Purified Oct-2 Mouse Monoclonal Antibody (OCT2/2136). Confirmation of Purity and Integrity. 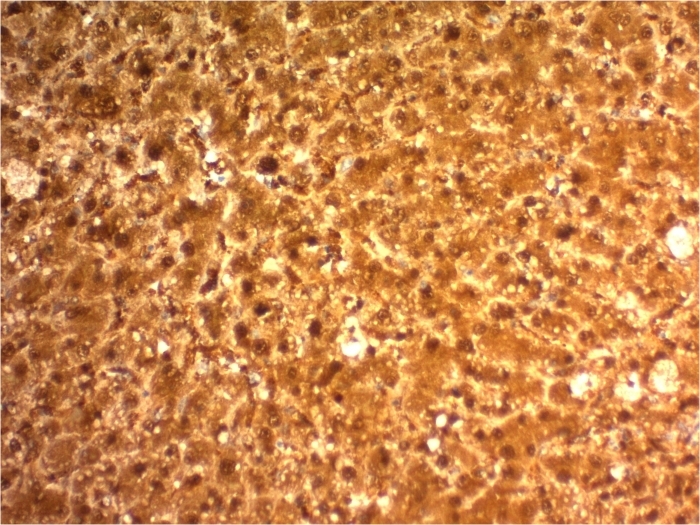 Raji or U-937 cells. Spleen or Tonsil. Oct-2 is a transcription factor of the POU homeo-domain family that binds to the Ig gene octamer sites, regulating B-cell-specific genes. 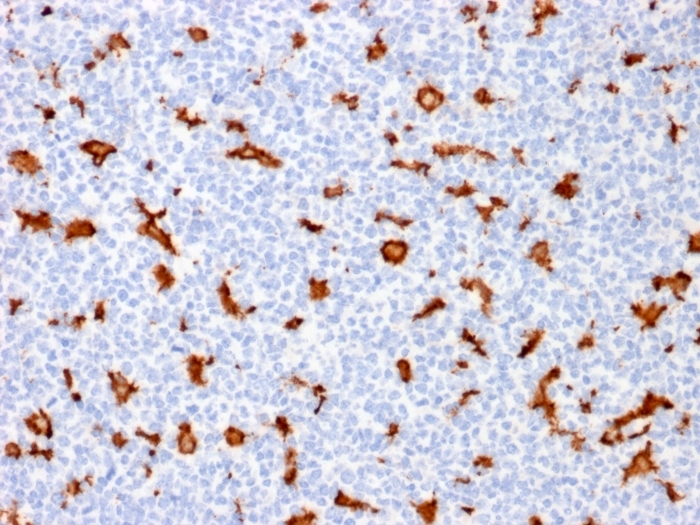 Oct-2 expression can be used as a marker of B-cell lineage and differentiation. Germinal center B-cells, mantle B-cells, monocytoid B-cells, and plasma cells show high level expression of Oct-2. 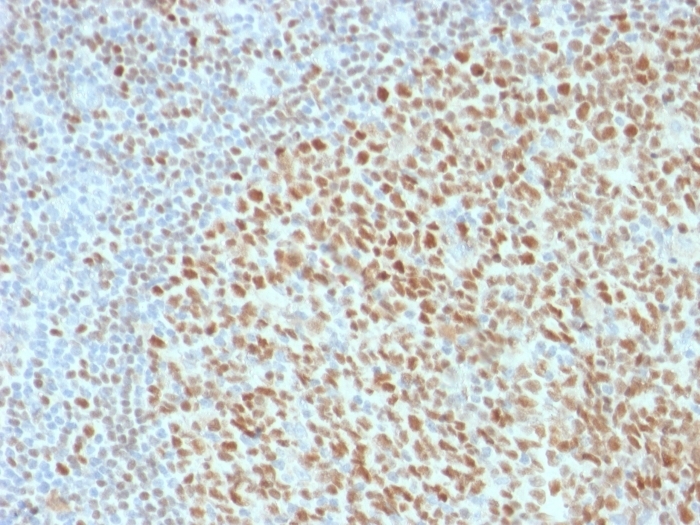 Additionally, mantle cell lymphoma, follicular lymphoma, marginal zone lymphoma, plasmacytoma, Burkitt lymphoma, diffuse large cell lymphoma, diffuse large B-cell lymphoma, Hodgkin lymphoma display increased expression of Oct-2. 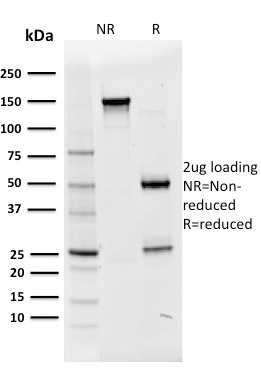 Several studies of Oct-2 expression have shown a low level expression in pre-B, T-cell, myelomonocytic, and epithelial cell lines, whereas all mature B-cell lines have high levels of expression. In spite of scanty evidence for Oct-2 expression in T cells, it is believed that this factor participates in transcriptional regulation during T-cell activation.